Applying a moisturizer is the fourth step in the Scruff Rescue system engineered to help men look their best. Choose from Daily Moisturizer or, if you're sporting facial hair, we recommend you consider our Beard Tamer. 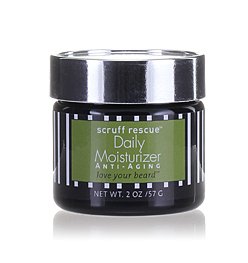 Scruff Rescue Daily Moisturizer is the final and arguably the most important step to looking your best. Crammed full of natural anti-aging retinoic acid found in rosehip seed oil and nourishing organic botanical phytonutrients, this face cream is an anti-oxidant powerhouse of anti-wrinkle skin nourishment. Designed to soak in to feed your face - it doesn’t just coat your face and leave it shining. Use at least once a day after applying the Ultimate Face Elixir, however morning and night use is recommended for maximum results. After using Scruff Rescue Elixir, dab Daily Moisturizer onto your cheeks, forehead and neck then massage gently until evenly distributed. Use just enough product to create a thin and easily absorbed layer. Avoid eyes. Use caution around skin issues such as acne, sunburn, psoriasis or eczema. In the event of unusual redness, discontinue use. Contains tree nut ingredients. Q: Does this work for men with sensitive skin.. Does it reduce redness caused by electric razor abrasions? A: We try hard to choose ingredients that do not cause sensitivities to the product user, and the formulations themselves should help suffers of sensitive skins. The best product to reduce the redness from electric razors will be the Scruff Rescue Elixir (because it contains Allantoin). The Scruff Rescue Daily Moisturizer will also be beneficial. Samples of both are available. Herbal Extract (Purified Water (agua), Tussilago Farfara (coltsfoot) Leaf, Symphytum Offinale (comfrey) Leaf, Centella Asiatica (gotu kola) Leaf, Camellia Sinensis (green tea) Leaf, Equisetum Arvense (horsetail/shavegrass) Leaf, Olea Europaea (olive) Leaf), Helianthus Annuus (sunflower) Seed Oil, Coconut Alkanes, Rosa Moschata* (rosehip) Seed Oil, Corylus Avellana* (hazelnut) Oil, Octyldodecanol (plant derived), Sorbitan Stearate, Hydroxypropyl Starch Phosphate, Prunus Armeniaca* (apricot) Kernel Oil, Behenyl Alcohol, Simmondsia Chinensis* (jojoba) Oil, Glycerin (plant source), Glyceryl Stearate, Dimethyl Sulfone (MSM), Erythritol, Sucrose Cocoate (from sugar), Lecithin* (GMO-free sunflower), Coco-Caprylate/Caprate, Hydroylzed Barley Protein, Hydrolyzed Soy Protein, Anisic Acid, DL-Panthenol (Pro Vitamin B5), Mixed Tocopherol, Benzoic Acid, Aloe Barbadensis* (aloe vera) Leaf, Cedrus Atlantica (atlas cedarwood) Essential Oil, Styrax Tonkinensis (styrax benzoin) Resin, Citrus Bergamia (bergamot, bergaptene-free) Essential Oil, Eugenia Caryophyllata (clove) Bud Essential Oil, Pelargonium Graveolens (geranium) Essential Oil, Lavendula Angustifolia* (lavender) Essential Oil, Rosmarinus Officinalis* (rosemary) Essential Oil, Calendula CO2 Extract.